Time for the original owners of this uniquely designed home to move on. Built in 1990 of brick and Canadian cedar, you will be surprised by the size of the home with so many hidden extras and storage on offer. 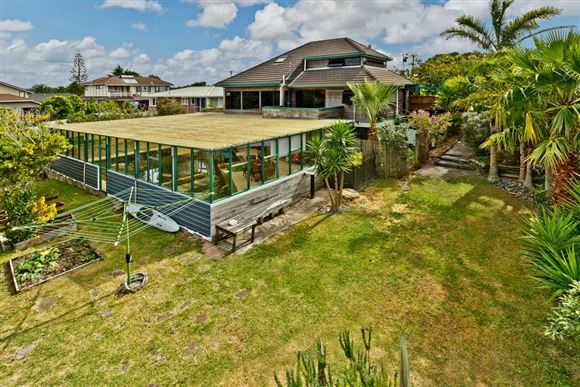 Living area with panoramic views to the Bays, Rangitoto and even the Sky Tower, 2 bedrooms with own loft access, study room, separate dining room, kitchen and family area with log burner and seamless flow to outdoors for summer entertaining. Master bedroom upstairs offering additional views, and separate room currently used as an office, or would make ideal nursery, or walk in robe, plus additional bathroom. The lower level offers a self contained studio area, plus a further bedroom to the main home and access to the covered outdoor pool and spa perfect for all year round entertaining. Set on ¼ acre and with well established fruit trees and native plants. Only minutes to Browns Bay or Long Bay, and only a short walk to Torbay school. With a little modernisation but keeping the character, you will reap the rewards long term.